English communal worker; born in 1821; died at Carshalton Sept. 9, 1898. Throughout his life he was identified with most of the London communal institutions. He was one of the original members of the Board of Guardians and chairman of the Investigating Committee of the Board. He was a founder of the Central Synagogue and a life member of the council of the United Synagogue. He served as chairman of the Building Committee, and was a vice-president of the Jews' Hospital and Orphan Asylum, to which institution he was a very generous benefactor. He was a member of the committee of the Anglo-Jewish Association, the Indigent Blind Society, and the Association for the Diffusion of Religious Knowledge. Beddington was a justice of the peace both for the county of Surrey and the county of London, besides being a founder of the City Liberal Club, and serving on the Political Committee. 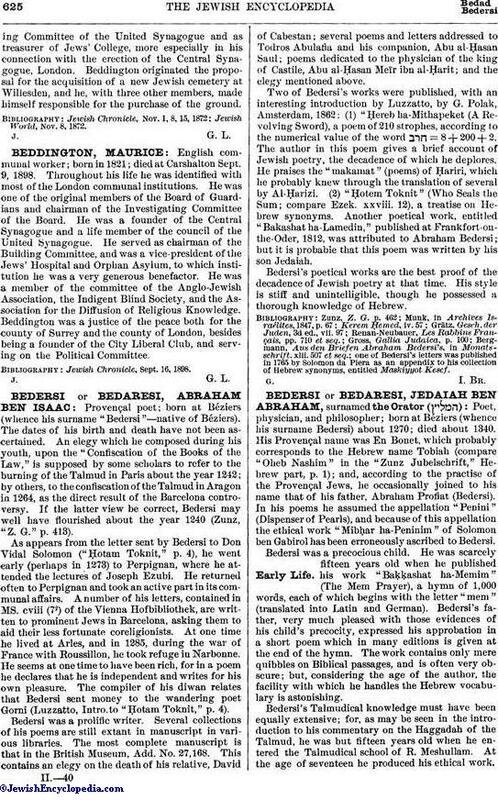 Jewish Chronicle, Sept. 16, 1898.